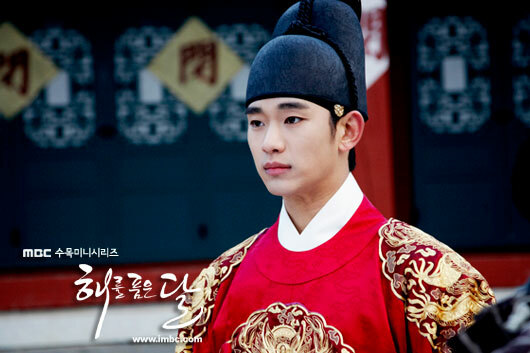 Yeon Woo (Han Ga In) dresses up in dangui (upper garment of female hanbok) and appears in front of Hwon (Kim Soo Hyun). 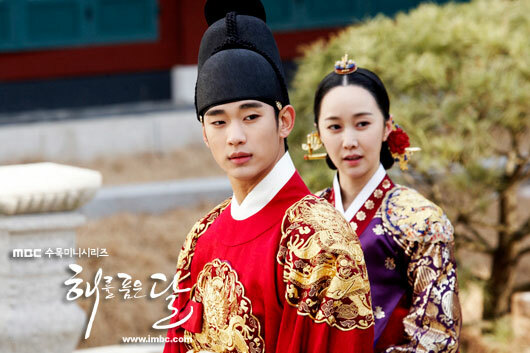 Hwon and Yeon Woo are reunited with kindly feelings in the vicinity of Hidden Moon Court. Especially Yeon Woo expressed that the clothing of shaman that she had always been wearing previously gave a heavy feeling, still the dangui in pink and azalea color is more beautiful, can fully demonstrate the beautifulness. But the reunion of Yeon Woo and Hwon is from the imagination of Hwon. What will be staged is Queen Bo Kyung (Kim Min Seo) goes for a stroll in the vicinity of Hidden Moon Court, and she confesses to Hwon, but Hwon is looking as Yeon Woo instead. The Yeon Woo and Woo reunion scene was shot at Yongin-si MBC Dramia on February 17th, 2012. The transformation of shaman Wol had been highly anticipated by the crews, the elegant charm of Han Ga In transformation had made the crews to come alive. After the debut of Han Ga In dressing in dangui with face full of delight appearance, the crews on the set burst into applauses, “dangui terminator,” “really envy,” “likes a flower,” the praises were generously poured out. The reunion of Yeon Woo and Hwon in the beautiful spring is broadcast through episode 15 of The Moon Embracing the Sun on February 22nd 2012.